8 spring flowers that’ll survive the frost. All Hoosiers know, Indiana weather changes all day, every day. While we at 812 like to embrace the unpredictability, we know the late cold snaps can spell disaster for your spring garden. To help keep your buds blooming, 812 asked Jo Ellen Meyers Sharp, Hoosier Gardener columnist for The Indianapolis Star, for the eight hardiest annuals to plant this spring. 1. Cornflower — This blue beauty has a long history of romance. Bachelors used to loop it through their buttonholes when they went courting. When: Sow seeds in early spring, as soon as soil can be worked. How: Plant 6 to 12 inches apart in full sun. 2. Primrose — The ultimate lazy gardener’s flower. It’s resilient, low maintenance and will multiply on its own. Plus, young primrose leaves make a tasty addition to spring salads. When: Transplant into your garden in late March to early April. How: Plant in well-drained, moist, fertile soil. 3. Dusty miller — Silvery-gray is the new black. 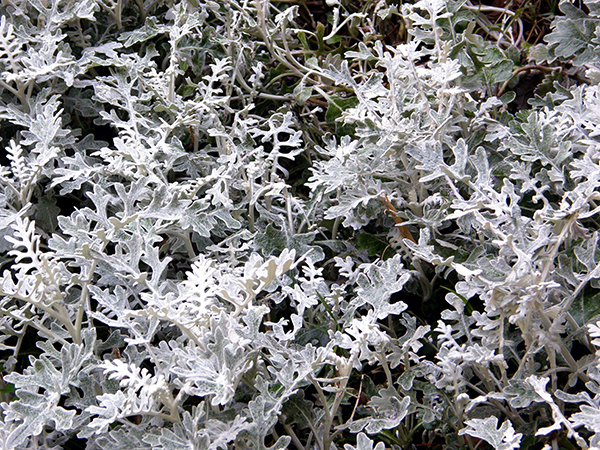 Dusty miller’s lacy texture and striking color complements any spring garden. Since its beauty comes from its leaves instead of its buds, sow it among blossoming flowers for variety. When: Start indoors in early February, then transplant in the beginning of April. How: Water moderately; it’s drought resistant and tolerant of heat and poor soil conditions. When: Sow seeds in early April, about two weeks before our last frost date. How: Plant in full sun to partial shade for longer lasting blooms. 5. Viola — Of the 525 to over 600 species in this flower genus, blue violets grow best here. When: Plant seeds around the middle of March. How: Space 4 to 8 inches apart in well-drained soil. 6. Sweet pea — All the rage in the Victorian era, this elegant climber is still a popular addition to spring gardens. When: Sow seeds around the last week of February. How: Plant other low-growing annuals in front of them to shade their roots. 7. Pansy — Hardy and cheerful, pansies bloom in a wide range of colors. Try the “Jolly Joker” for orange flowers with dark purple petals and the “Princess Series” for a mix of blue, purple and yellow. When: Transport into your garden in late March. How: Pour general, all-purpose fertilizer around their roots to help them grow. 8. Telstar dianthus — Known for its dainty fragrance, this blossom thrives before leafing trees and shrubs have a chance to block its sun. When: Transport into your garden in late April. How: Plant at least 8 inches apart, either in the middle of your flowerbed or around the outside for a stylish border.